PORTABLE OFFSHORE LED EXPLOSION PROOF PORTABLE LIGHTS are available in both Class 1 Division 1, Groups CD and Division 2, Nema 4x ratings. All of the styles of lights will carry a UL844-P4 compliant listing for portable use. Currently Boss offers offshore portable lighting on tripod stands, rail clamps, cages and deck stands. Most popular is our BOSSLTG #FS150LED-120V. This is a 150w LED floodlight that will illuminate 10,000 square feet and project light 100′. Comes with a 100′ power cord with an EXP 5-15P 120v Plug. The floodlight is protected be an aluminum fixture bracket that allow the glass lens to be protected by an aluminum guard. 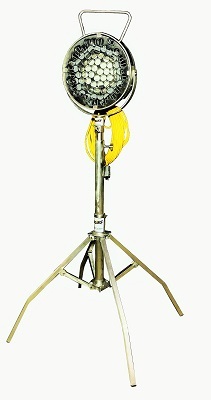 Also, this style of fixture comes with replaceable plexi-glass lenses. Boss offers UL Compliant products with protective cages that allows fixtures to be mounted to walk ramps and side rails. 2000 lb. rated pipe clamps secures fixtures in place and still allows floodlights to be adjusted as needed to re-direct light patterns. 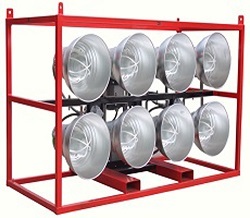 Most important features for offshore floodlights is the spring supported brackets that allow the fixture to be suspended to allow the floodlight springs to absorb the vibration and mechanical shock from abusive wave actions. PORTABLE OFFSHORE LED EXPLOSION PROOF PORTABLE LIGHTS are UL844-P4 validated by Bossltg. Boss is a UL Certified Portable explosion proof lighting assembler along with being a UL certified portable electrical power distribution assembler.